Jackson Pollock was a famous painter of American origin who played a key role in the famous abstract expressionist movement. Pollock earned his fair share of recognition and fame throughout his life and was one of the leading artists of his generation. The artist was mostly known to remain isolated from the materialistic world but he led a very unstable life while struggling with the habit of alcoholism. He created numerous famous abstract paintings in his entire life. The artist gained massive recognition for his unique style of painting called as drip style. Unfortunately, at the age of 44, Pollock lost his life in a car accident. Pollock faced a tough early life and this gave rise to his bullish character. Nonetheless, the artist was explored to some great styles which made him mature as an artist. Right from the time invested in creating realist murals in 1930s to describing the unconscious by means of Surrealism, the artist had a knowledge of the wide genres of the subject of art. After Pollock started visiting a Jungian analyst, to treat his drunkenness and alcoholism, the analyst supported him to draw. This was a turning point as it helped in shaping Pollock’s understanding towards the subject while helping him showcase the deepest thoughts of his own mind. 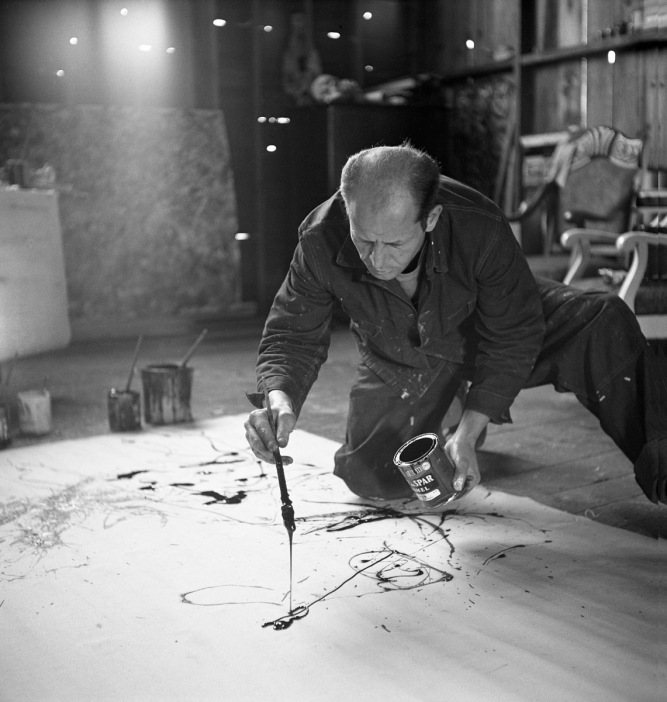 Pollock is known for developing the most unique abstract styles to be ever created in the history of art. The artist chose to separate limes from colours and then defined his own unique style of painting which led to him creating some of the most famous abstract paintings which the world has witnessed till now. If there is one part in the life of Jackson Pollock which shot him to fame, then it has to be this one. The artist created his most famous and eye-catching abstract paintings within a span of three years. Right from the year 1947 to 1950, the artist had created those masterpieces for which he’s remembered even in today’s times. However, when the artist was at the pinnacle of success, he suddenly abandoned the style which made him famous in the first place. After the year 1951, the artist started creating paintings which included darker colours and they were mostly painted on un-primed surfaces of the canvas in black colours. Being referred as ‘Black Pouring’, these paintings never got sold when they were first showcased in the exhibition at the Betty Parsons Gallery in the city of New York. Jackson Pollock left a legacy after his death and his contribution to the world of art was such that his famous abstract paintings serve as a source of inspiration for the artists of today’s times.